As you can see, a lot of thought has been put into the home page and articles features on it (sections 1-5). I haven’t had much opportunity to flesh out the Get Help and Join Fedora sections yet, although I know Diana Harrelson’s anthropological study of the Fedora community is chock-full of useful data and recommendations, especially for the Join Fedora section. If you have any ideas or suggestions for either Join Fedora or Get Help please let me know, since we’re still in the process of fleshing out those sections. The position of individual elements on the screens will probably change. The one item I do not want to move is the download button in the right sidebar, though. I want it to be approximately in that area, although it may move up to be inside of the banner. This is because especially around a release, many users visit the website in order to download Fedora so the download button needs to be prominent. The main banner is meant to be a slideshow. I’ll show some examples of alternative slides for it below. The idea was that the first slide would introduce users to Fedora, and subsequent slides will show you particular new features or highlights of the latest Fedora release. We’ll also have a slide in there to promote our community. This page is so very rough – and these features are by no means exhaustive or even the right ones, just filler for now. Ian MacGregor put together an initial list of tutorials for the tutorial section of the website. What do you think of them? Would you change any of them, or add additional ones? Do you know of any tutorials that already exist for Fedora that would be useful that could be formatted for the site? This article category still needs fleshing out. I’d like to see 5 article topics for it. ‘Your Life on Fedora’ is meant to show real-life use cases of Fedora users in a variety of situations – maybe an interview of a student with a sidebar highlighting her favorite apps, for example. My hope is that someone new to Fedora would come away from this set of articles with a better understanding of how Fedora might fit into their life. What makes Fedora different is another article cateogory that needs more fleshing out. It is targeted at both users of other distros and other operating systems to point out what makes Fedora different from what they use now and to set their expectations. Why would you pick Fedora over another Linux distro, for example? Folks should have an answer to that question after reading this section. Writing Articles – Do any of the tutorial ideas above appeal to you? Do you have even better tutorial ideas? Want to write a tutorial that will appear on fedoraproject.org? Brainstorming Article Ideas – Do you have ideas for articles in the ‘Your Life on Fedora’ or ‘What Makes Fedora Different?’ categories? Do you have a story about Fedora you’d like to share? Would you be willing to interview a friend or family member who uses Fedora? Mockup feedback – Do you see any crackrock in the mockups I’ve posted here? (Of course you do!) Call it out! Let me know where we’ve goofed in the mockups, and your suggestions will be warmly welcomed! Ideas for Join Fedora and Get Help – Do you help field questions on Fedora on the users list, forum, or IRC help channel? Have some great ideas for how the ‘Get Help’ pages on fedoraproject.org could be organized? Have you helped on-board various new Fedora contributors and have some experience you’d like to share for the Join Fedora section? Content for the Features Page – Does the crappiness of the filler content in the Features mockup above give you severe indigestion? Do you have a clear idea of how we should be broadcasting Fedora’s features and have the time and will to write it up? 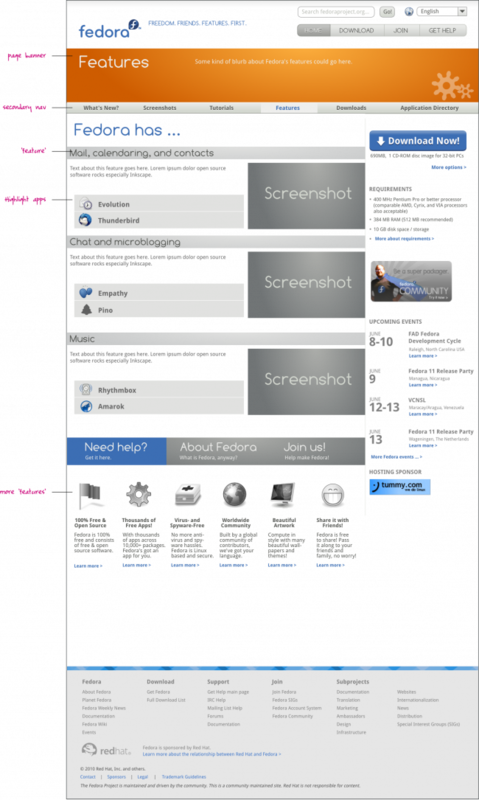 Anyhow, our work on the website in preparation for Fedora 14 continues; I just wanted to check in with you all and show you the latest. Please feel free to continue the conversation in the comments area on this blog post, or on the websites list, or in the websites channel at #fedora-websites on irc.freenode.net. 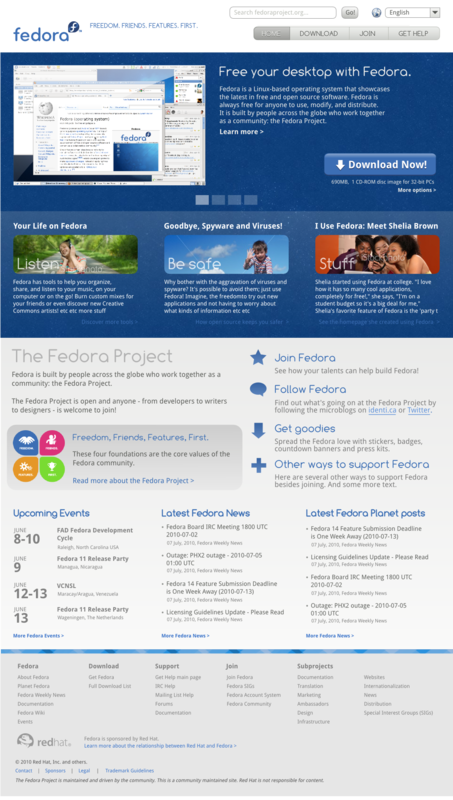 We need your help to make Fedora’s website great; thanks for all of the feedback and suggestions you’ve given so far – it’s what’s gotten us here! Once more great job Máirín. Just a tip if no one remembered this before… ask infra-structure team to keep a detailed update on hits/pages and check what people visit most and promote more those fields (not ignoring the strategical fields such as contribution mongering). On a personal level, I love the work being done, either in eye-candy and also in information placemente. One question: What is the name of the font you use for the annotations (the handwriting one)? Much better than the current website! Looks a bit like Ubuntu’s homepage which is great! Good work! I meant the layout and the presentation of the relevant information is similar and much more organized. Aesthetically, I think that your mockup is much much nicer. Fedora’s site really needs this overhaul. As a relative newcomer to Linux, I’ve been distro-hopping for a while now. However, since Fedora 13’s release, I’ve been making a personal pact to stick with Fedora for a time since it impressed me so much this release. In doing so, I’ve been trying to get a little deeper into the community, although as I’m sure is the case with many mid-range computer users, computing doesn’t get a lot of allotted time since it’s more of a hobby than an ambition. With that in mind, I think it would be fantastic to see a tutorial series that addresses some of the more advanced aspects of Linux. I’ve tried to teach myself some, and I’m sure there are resources out there, but my knowledge of things like the terminal are pretty haphazard. I can see the series covering the terminal, better package management, compiling, virtualization, etc.. I would also love to help out in writing something of the sort if it caught on and someone with more experience could offer some recommendations about where to find information. I would love to learn more as I chipped in a project like that. As an aside thought, I find that Fedora’s policy of not dumbing down Linux is fantastic. It’s exciting to think that a new Fedora website could offer advise on how to really use Linux instead of using workarounds, but in simple enough terms that someone like myself could help my friends and family understand. And, by the way, I think the website mockup looks absolutely fantastic! Hey we just launched the new website today, but I remember your suggestion to have more advanced tutorials. Would you be willing to help improve the new website with some more advanced tutorials? I was thinking maybe a tutorial showing how to start a virtual guest from scratch would be really interesting. What do you think? Obviously that’s not the layout we’re going for, and it’s just a slightly adapted version of yours, lol. But it may contain something useful. I like the three column structure towards the bottom… and the icons as well. We definitely have a lot to work with 🙂 I want to post your mockup to the main wiki for this if you don’t mind. I haven’t started a thread on list yet so feel free! I’ll create a thread tonight. I wanted to look up the F14 release schedule and went to the current http://www.fp.o site; and was lost as to where I’d find it. Well, then I figured the wiki might have it somewhere. Saw a search box there, typed ‘Fedora 14 release schedule’ and was presented a set of irrelevant links. Back to the wiki frontpage, saw the ‘What’s inside Fedora’ section, which had a link to a release schedule doc, which again didn’t have what I wanted. Clicked the next link, F14 features, which thankfully had a link to the F14 release schedule at the bottom of the page. – This includes all the postmortems, feedback, marketing links, features, release schedules, d/l info, etc. Great! When i was switching to Linux, i didn’t know much about it and i looked at popular distros, and i chose Ubuntu, not becouse it’s made for newbies, but becouse it had the coolest website 😀 Seriously, the first impression of the distro comes up with the first view of the website. I want to say GREAT JOB ! I like the first and the third design, especially the first. I hope you use that one !! Good luck with finishing the project! !